And he had a DSLR camera, so win-win! I was, understandably, rather excited. I had never been to such an event before and – whilst it wasn’t a surprise – it was striking to see the media attention the launch had drawn in: Sky TV were there, BBC News, a variety of motoring journalists and a few recognisable faces from the F1 world, and I hadn’t even walked through the doors of Unit 3, Avonbridge Trading Estate. Parking was scarce but we squeezed in behind an Audi – we were one of the last to arrive. 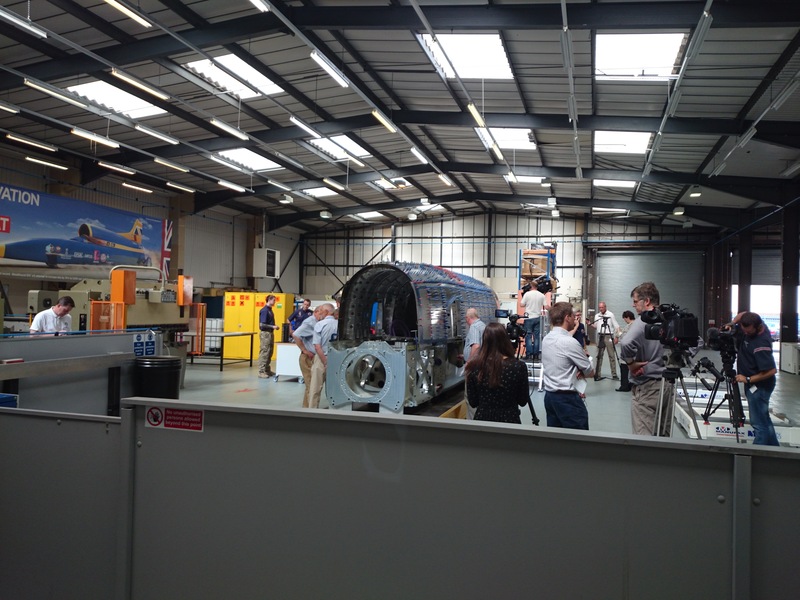 However the event had not officially started and we were bustled inside by Jules Tipler, who did an excellent job for the Bloodhound team in gathering everyone together for the occasion and who also allowed me to bring a guest, so big thank you to him. Such was the final flurry of arrivals that we didn’t even get to pick up a nice little ‘PRESS’ badge (although we got one at the end to feel important!). I was then greeted by fellow motoring journalist Daniel Puddicombe who had already been inside for at least an hour, so I could imagine how annoying it was for him to watch us wander about and take in the factory whilst he had already seen it all! And there, taking centre stage, was the car itself. It was far lower, narrower and shorter than I had anticipated. It peacefully sat in amongst the hubbub of media activity which, ironically, hardly struck the impression of a 1000mph powerhouse. Not necessarily a bad thing, as it invites you in to gaze at its meticulous detail. Everyone was then gathered into about 40 or 50 seats which faced 3 TVs and a huge speaker stack for a presentation about the car. The talk was spearheaded by Chris Fairhead, Mark Chapman and, the driver himself, Andy Green. Chapman’s talk in particular struck a particular chord with me. 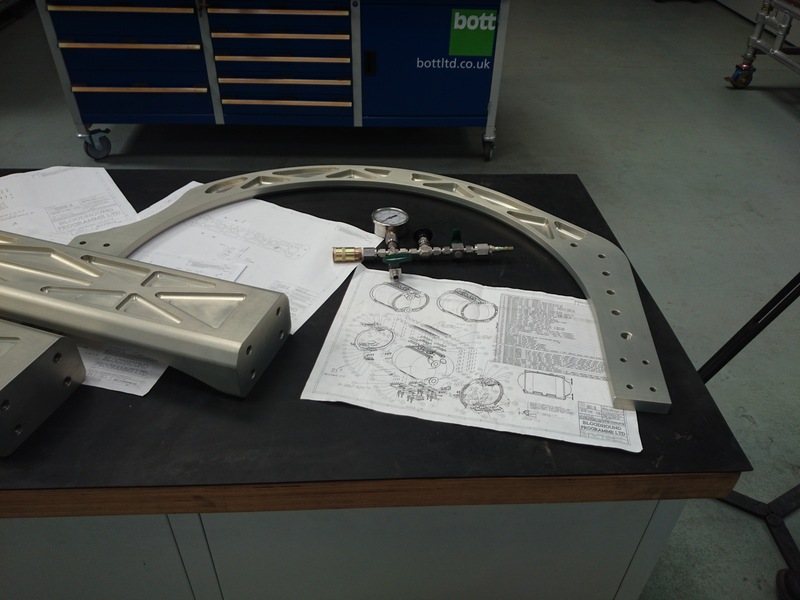 Above you can see an image of what the team describe as the “Goat’s Head” – the machined 7075 alloy structure that critical components such as the suspension, brakes and hubs all mount to. The reason behind its name is also interesting. 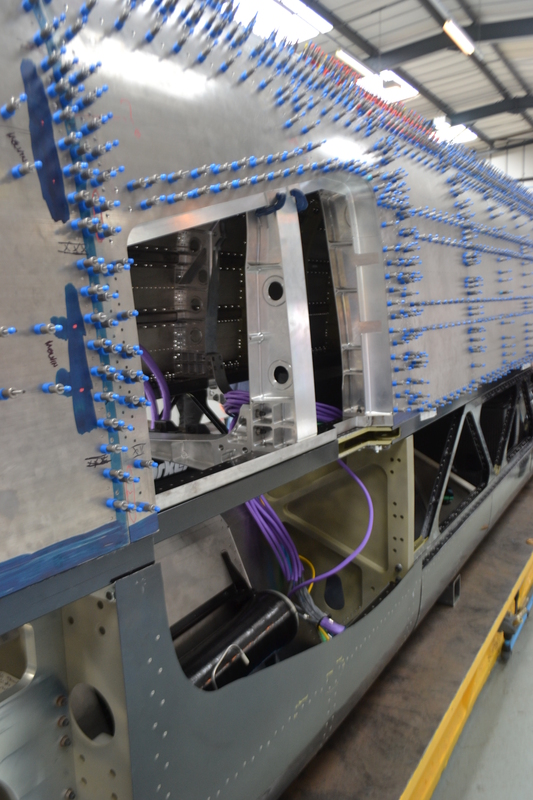 The team stuck a virtual block of 7075 into a computer simulation software, considering the load requirements and minimum dimensions needed for the component to withstand and fit within the confines of the front bulkhead. The computer then erases all the unnecessary material to form as small-a-shape as possible. What came out was something that appeared to look like an animal’s skull, hence it was dubbed as the Goat’s head. The statistics about this piece are absolutely staggering. In CAD form above it looks very complex but in raw form it’s beautiful simplicity. It is composed of three individual pieces that originally started at a total mass of 924kg, yet is now just 68kg thanks to the computer software mentioned above. 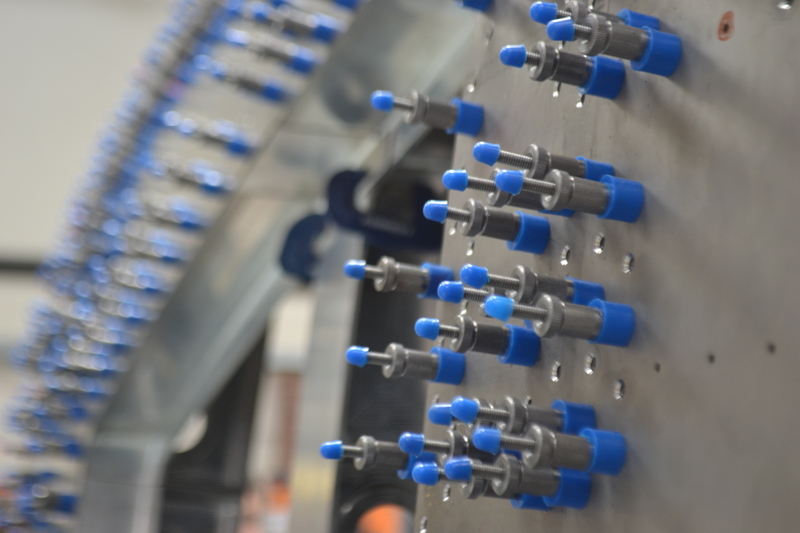 It took 151 days to produce and can withstand about 30 tonnes of loading at top speed. Rest assured, Andy Green can have total confidence that the car will point in the right direction. 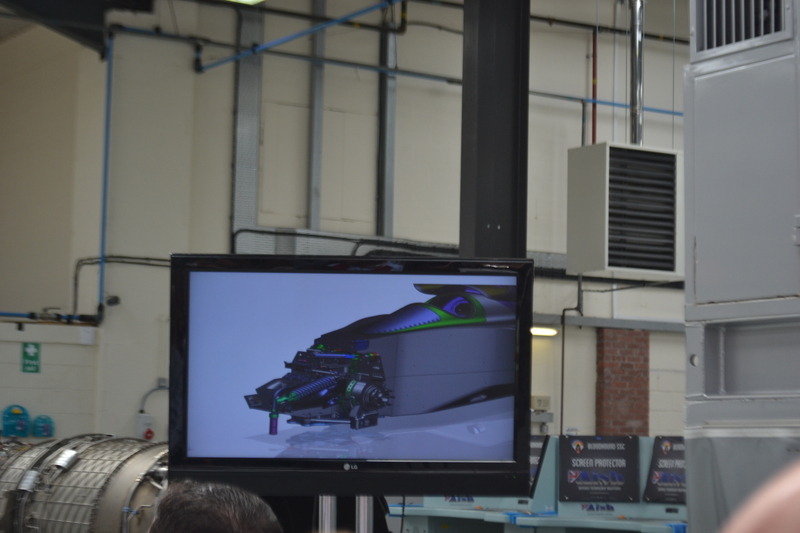 After the presentation – which also included a 100 decibel sound blast from the speaker stack to attempt to represent the cockpit noise Andy would be experiencing – we got to ask a few questions before taking a proper look round. I was curious as to whether the team had to develop a new tyre for runway testing as the Bloodhound is far quicker than its predecessor, Thrust SSC. The simple answer to that: no. 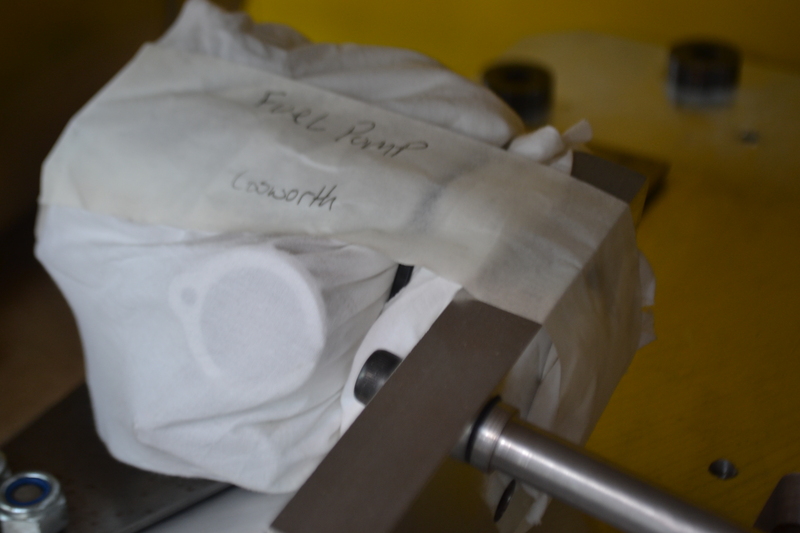 They requested Dunlop to reproduce the tyres they used on the Thrust but to higher, modern standards. 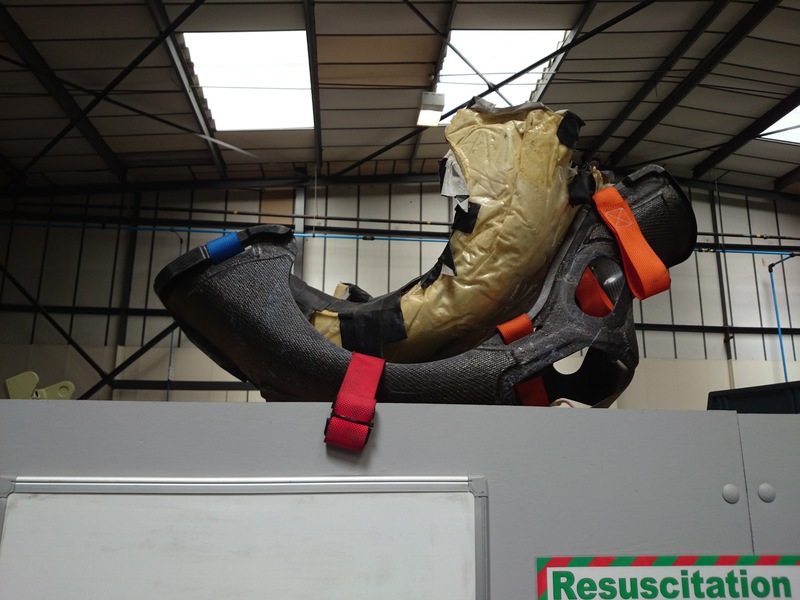 The cockpit’s canopy. 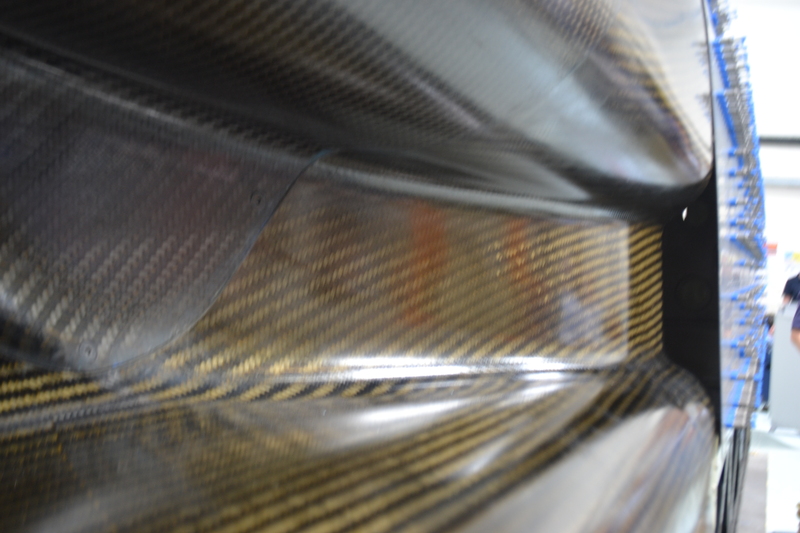 A lovely blend of various carbon fibre weaves and 50mm acrylic. It generates a series of shockwaves at high speed to slow air down from 1000mph to 600mph in just over a metre. The wasted energy generates a huge amount of noise, estimated at close to the 120-140dB region audible inside in the cockpit. Here’s the star of the show: the cockpit. 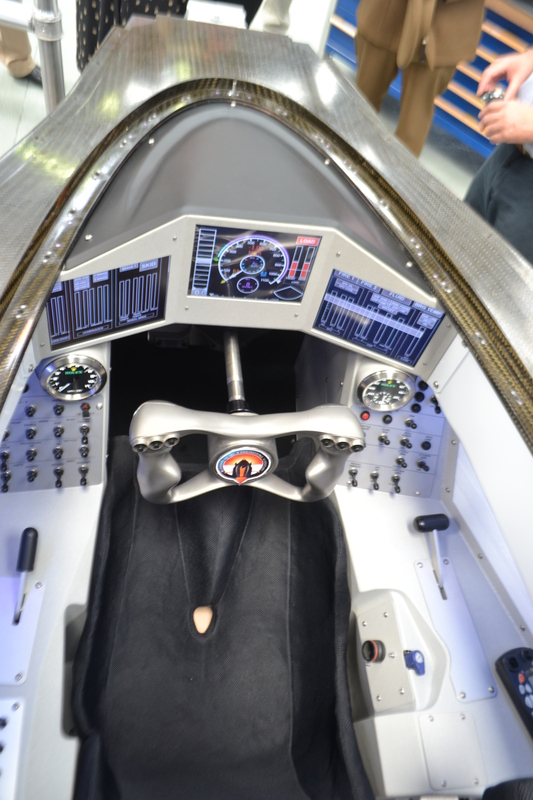 The blue interior lighting and three displays give it a sense of futurism and quality. 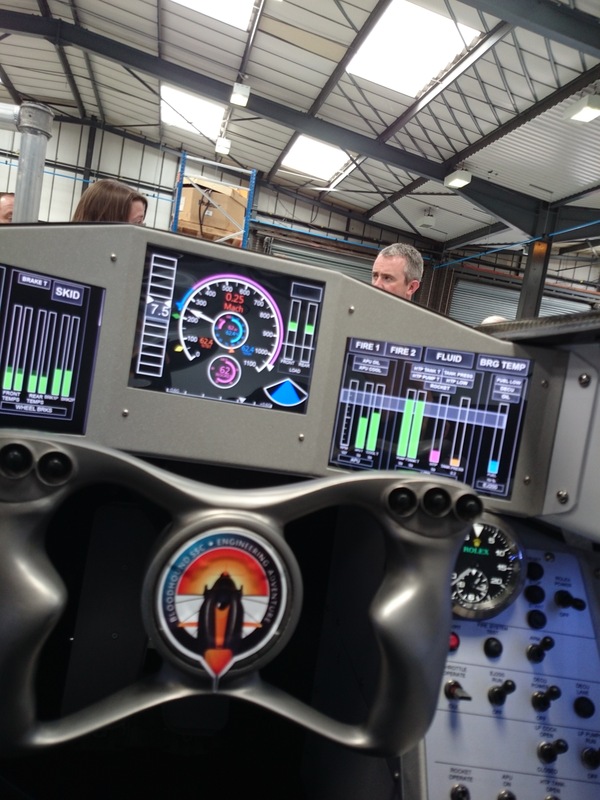 There are 3 main displays and a series of switches to control the MGT engine (that acts as a fuel pump) the jet engine itself and the rocket fuel. 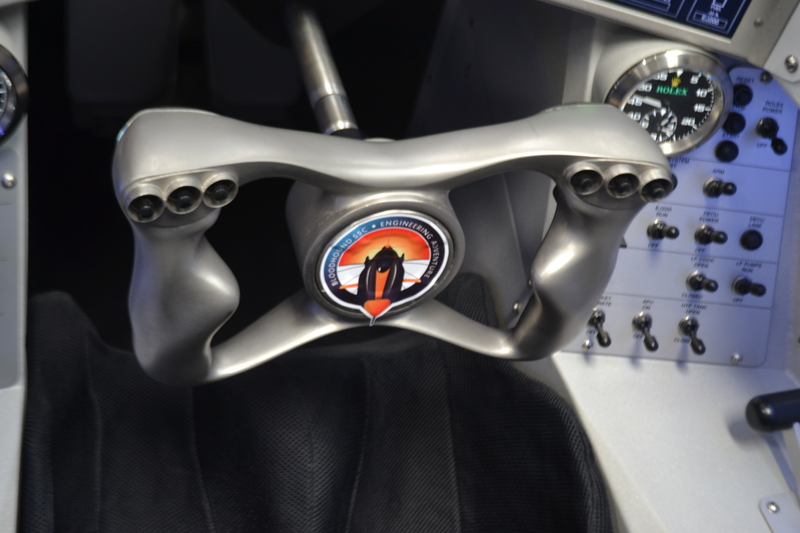 The steering wheel is 3D printed titanium and is shaped around a mould of Andy Green’s hands. There are 6 buttons and two triggers on the back. The central screen is, obviously, most important. 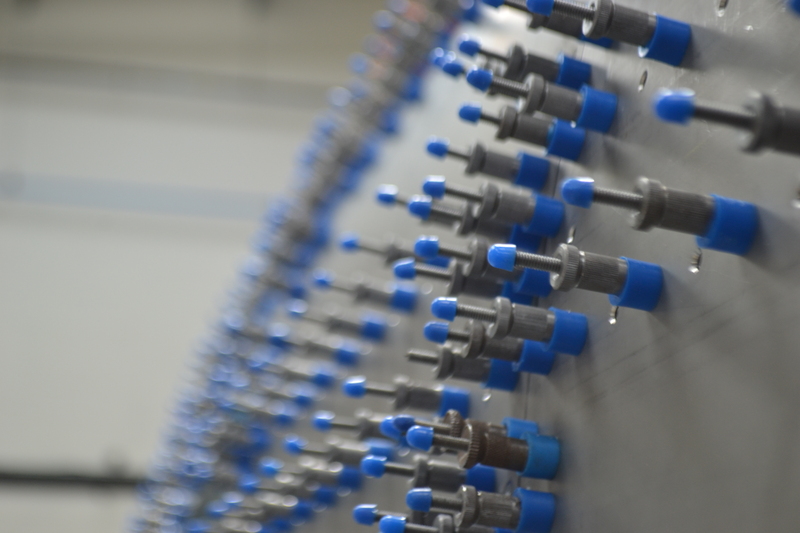 It displays speed, time and wheel loads. 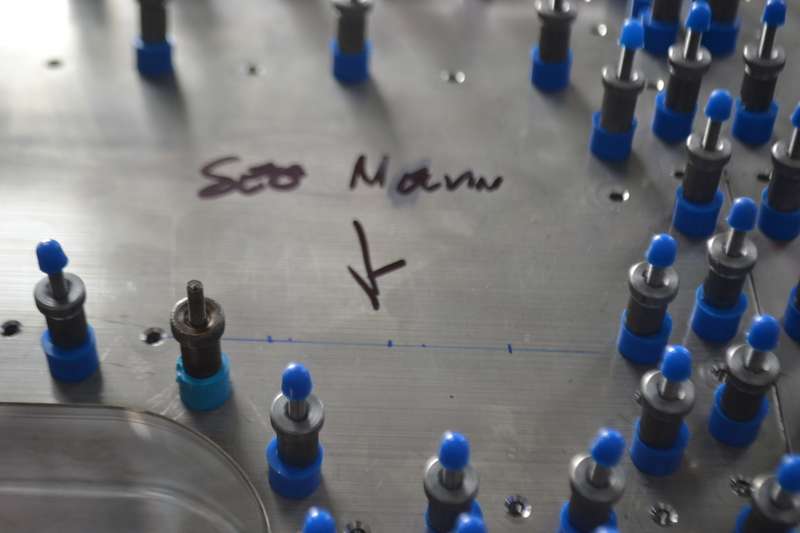 Another neat feature is that there are small coloured diamonds that move around the speedometer to indicate when to ignite the rocket fuel, pull the parachute and other processes. It’s a very neat, well laid out system. 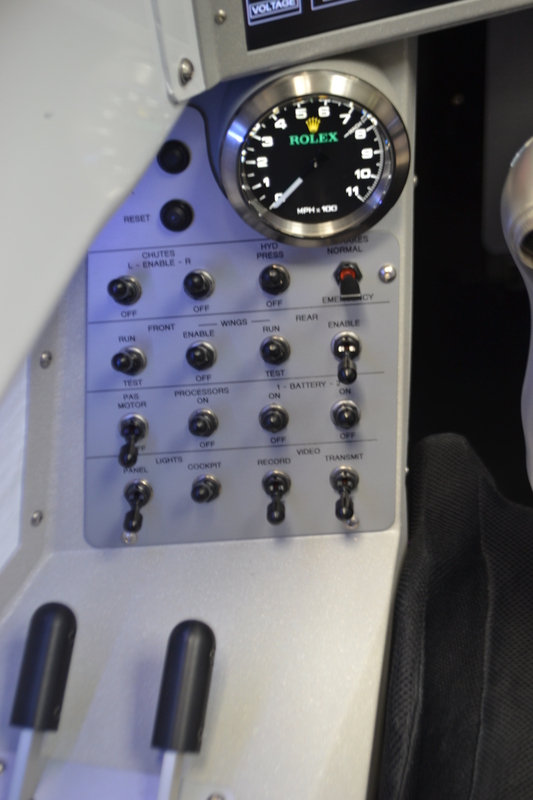 As a back up, Rolex have provided timing and speedometer equipment that run off their own battery and GPS system, just in case. The two levers to the left deploy the two parachutes via a cable should the electronics fail. 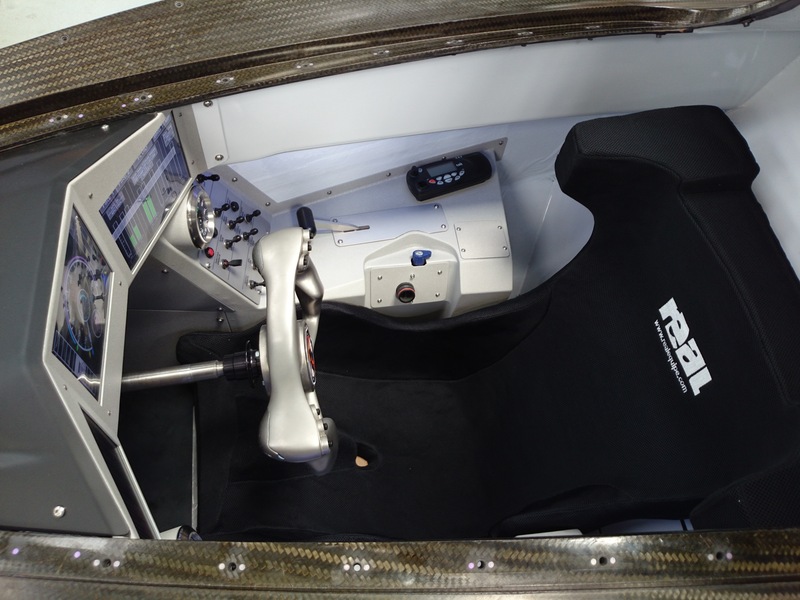 It’s a bit blurry, but these are the two pedals inside the cockpit. The left applies a set of 4 AP Racing brakes that can be used from 200mph downwards and the right is the “go faster” pedal. I was quite confused about the seat, because there was one lying around! 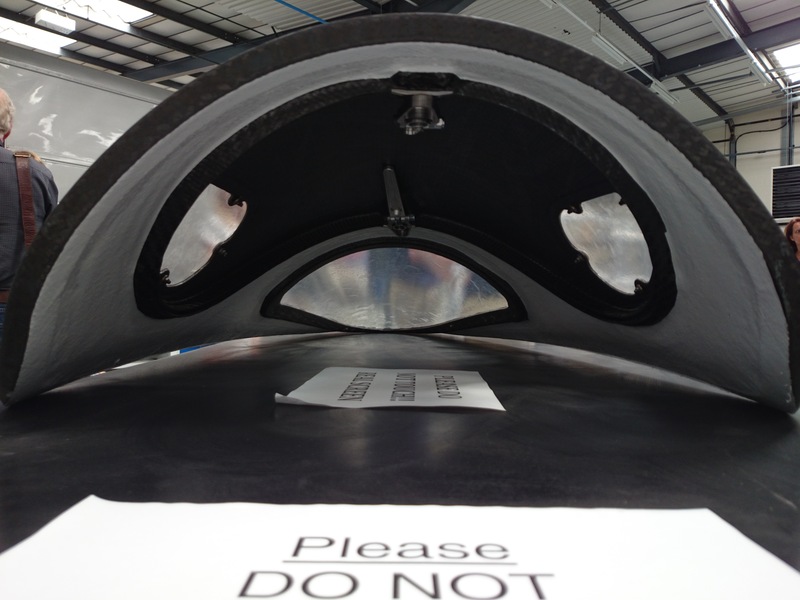 This must be the carbon fibre “backbone” beneath the moulded top surface that was inside the cockpit, I think. 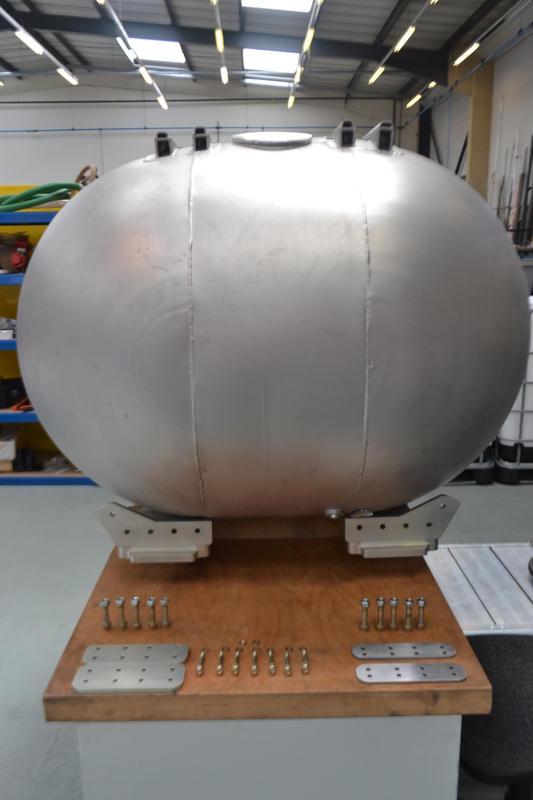 High Test Peroxide rocket fuel tank, with a capacity of 1000 litres, made by ABC Stainless Ltd. The whole lot will be empty in about 17 seconds for each run. 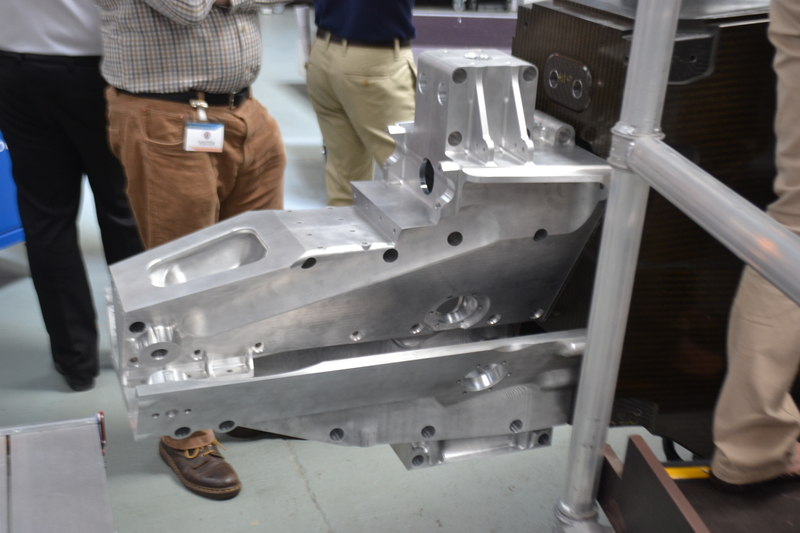 Blueprints and a few parts of the HTP tank’s mounting frame were also out on display. 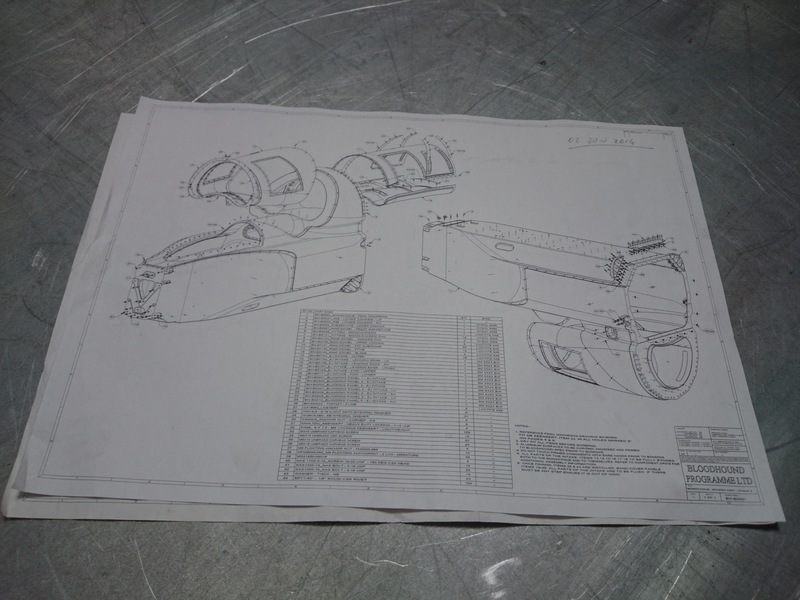 Blueprints of the monocoque and the “airbox” jet engine intake above. 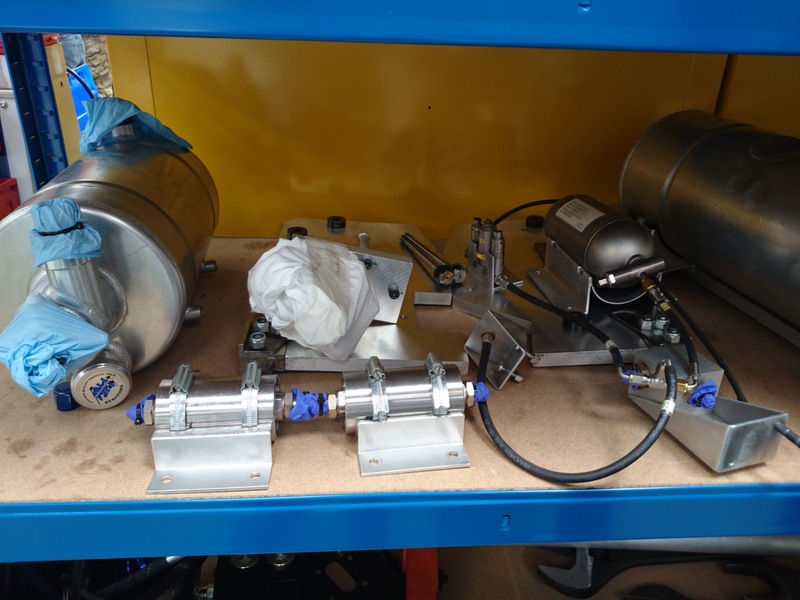 The fuel pump system for the engine, that is used to pump the jet engine fuel. Cosworth were the original suppliers but backed out after they were bought out, so the team got hold of an MGT motor instead. 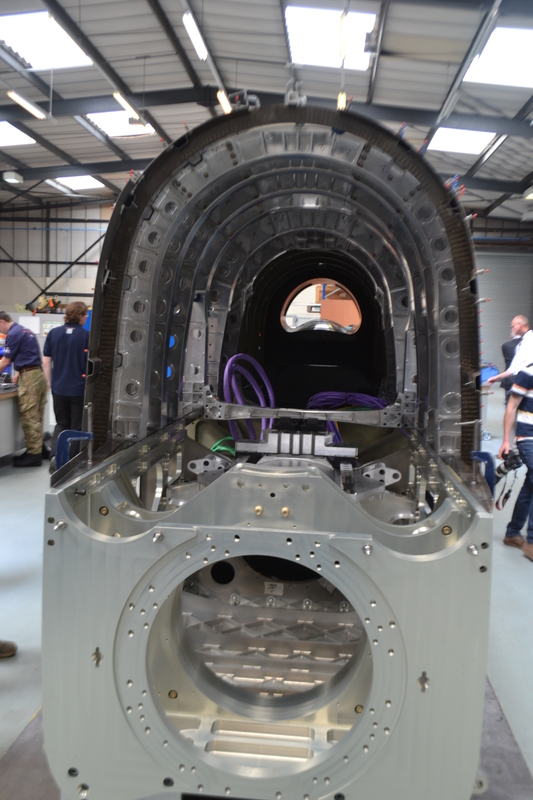 There are two sections to the Bloodhound’s chassis: upper and lower. These were recently united and the car is finally coming together. 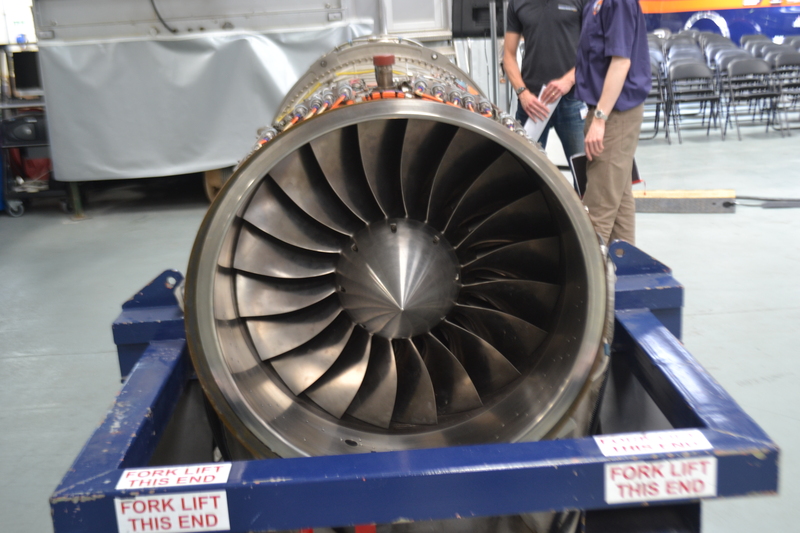 The jet engine lies in the upper section, fed by the huge air intake. 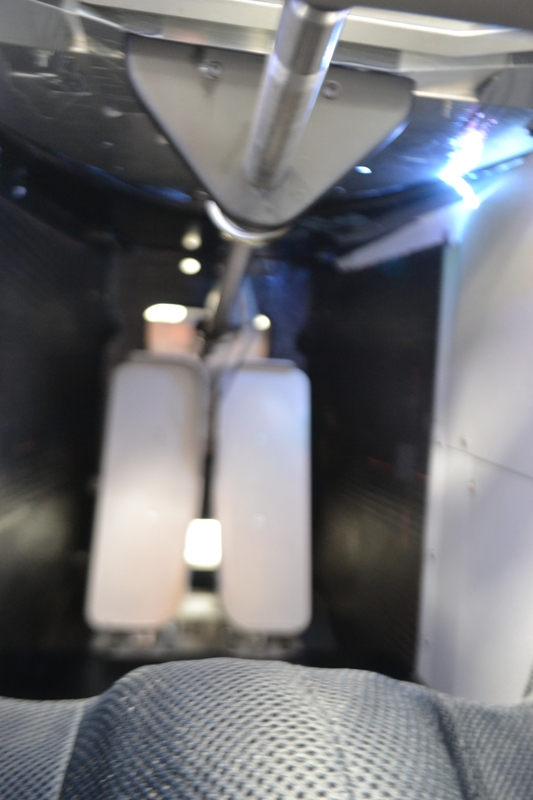 The rocket sits lower down and exits beneath. 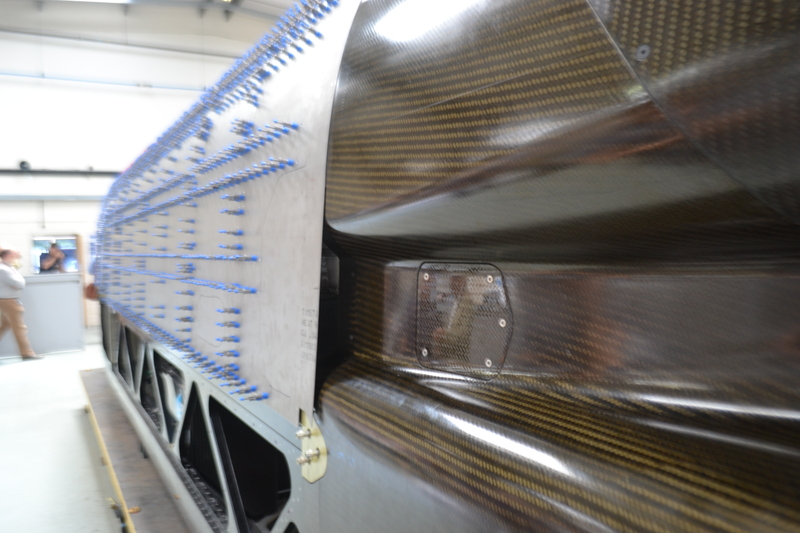 There are about 11,000 rivets that seal these sheets of titanium onto the upper chassis, all of which are hand drilled and take 5 minutes each. 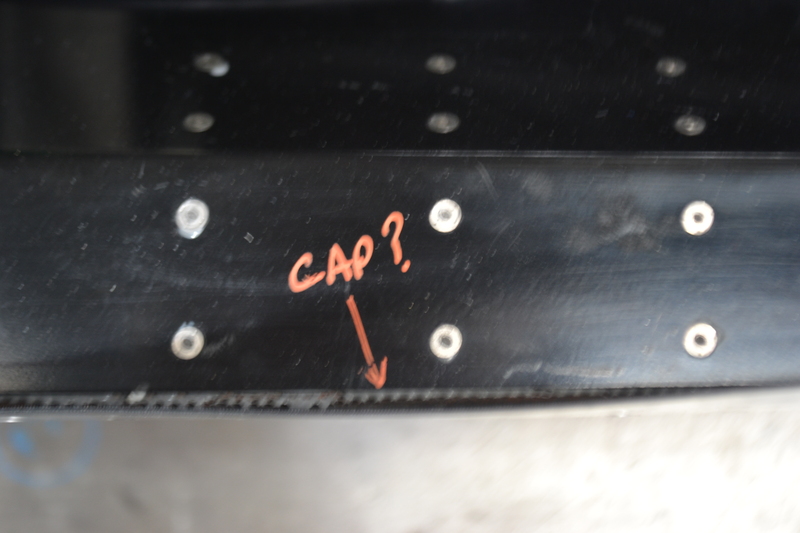 The gap here is for the air brake system. 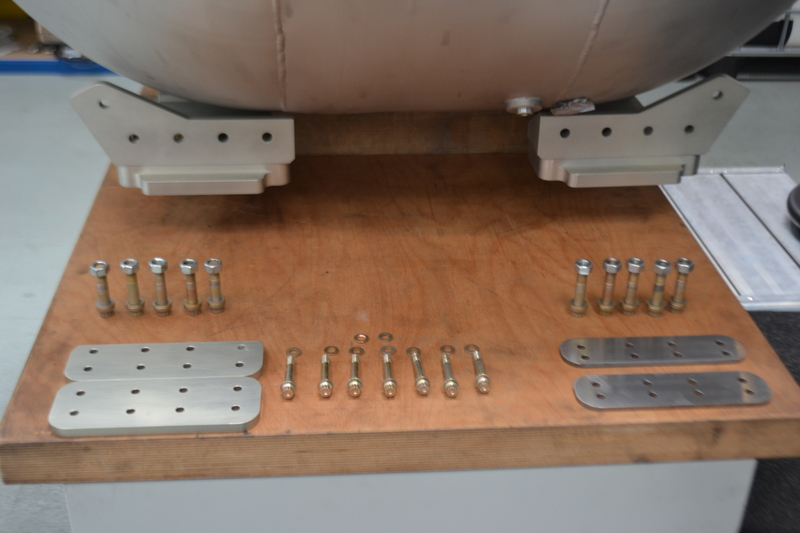 If you have ever spotted the air brakes on their website, they have numerous holes cut into them. This is because the shear turbulence created behind when they activate would rip off the rear suspension, so compromises had to be made. 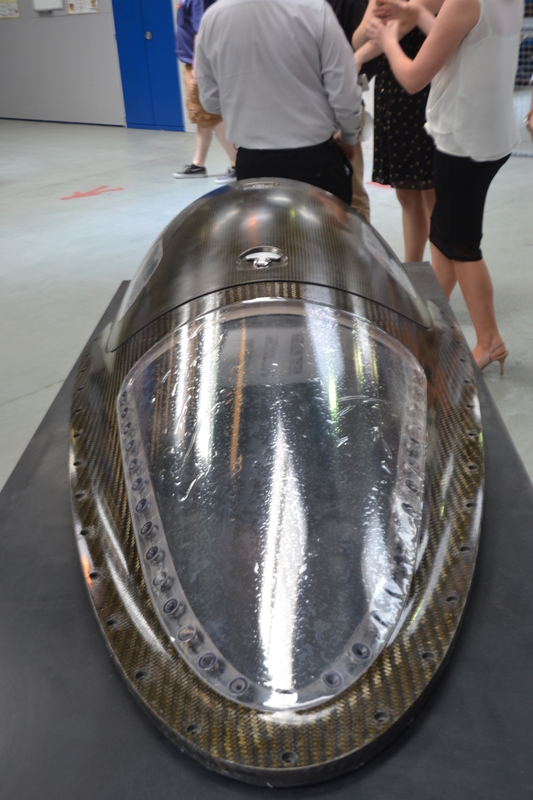 The jet engine fuel tank sits roughly in the middle of the car just ahead of the rocket. 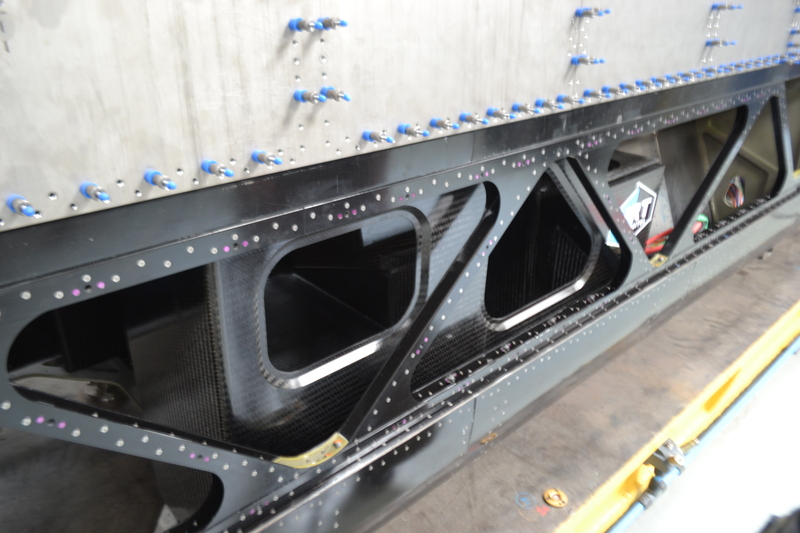 The MGT engine then sits right just ahead of that against the monocoque and the rocket fuel is housed within the monocoque itself. All-in-all, it’s a tight squeeze but it’s done in an elegant way. 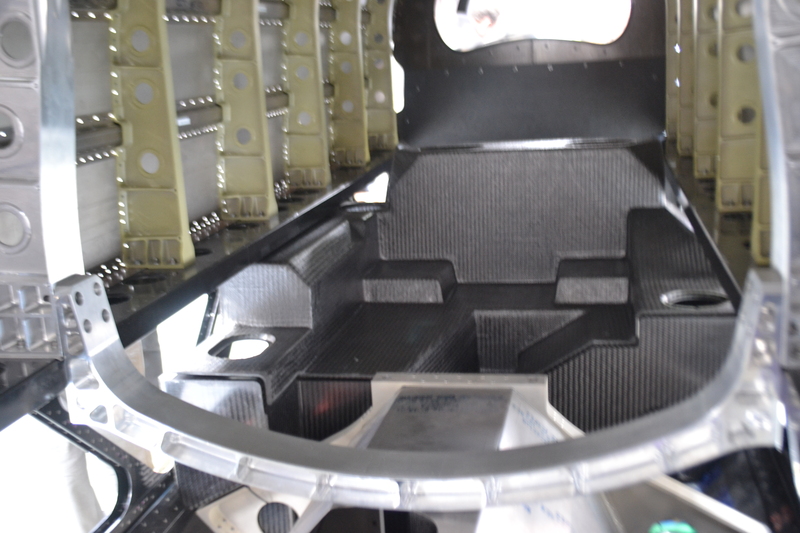 The rocket fuel is refilled via the small removable panel just before one of the air intakes that flank each side of the car. Amazingly, the MGT engine doesn’t even need a radiator of its own. It sits within an ice jacket that is only cooled by the air passing through the inlets. 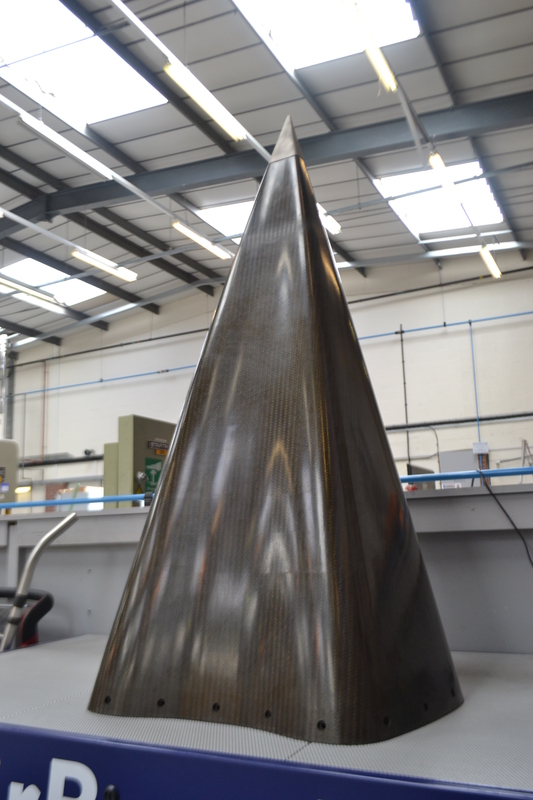 The nose cone assembly is another meticulously crafted piece. I wish I had asked to pick it up but it looked incredibly lightweight. 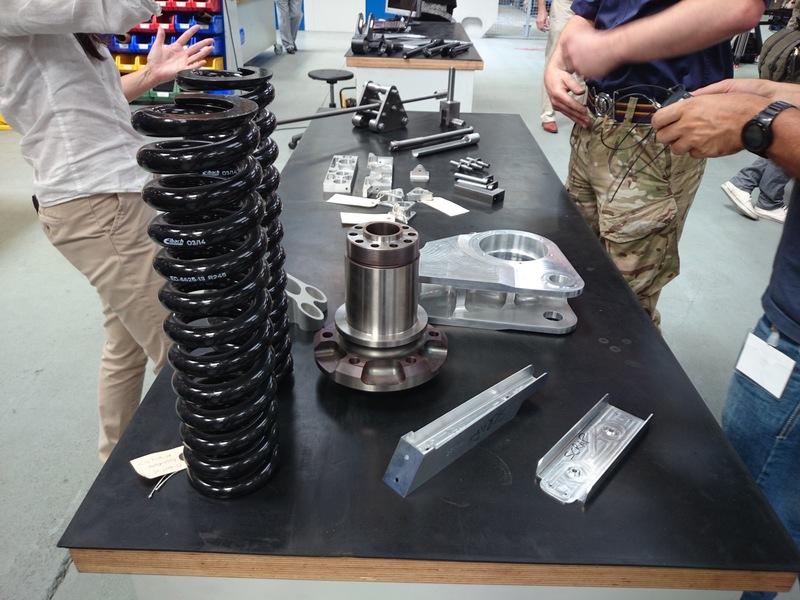 Various bits and pieces were out on display, including suspension springs, front wheel hubs and brake components. 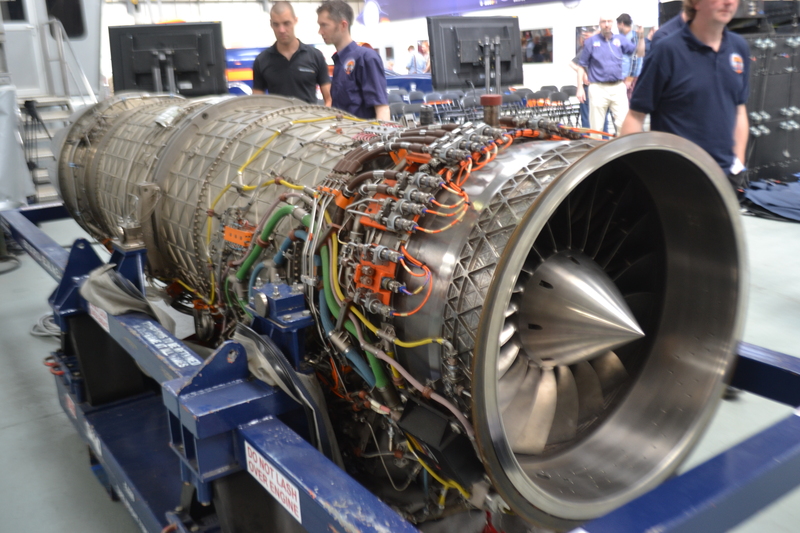 The Eurofighter EUROJET EJ200 engine was also out on display. Surprisingly this is under a seventh of the total mass of the car before it sets off at just over one tonne. 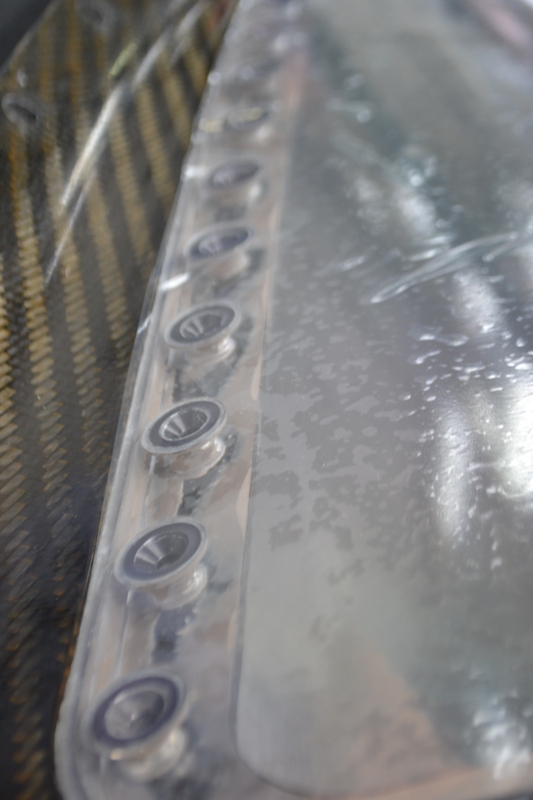 The onboard fuel is close to 3 tonnes. 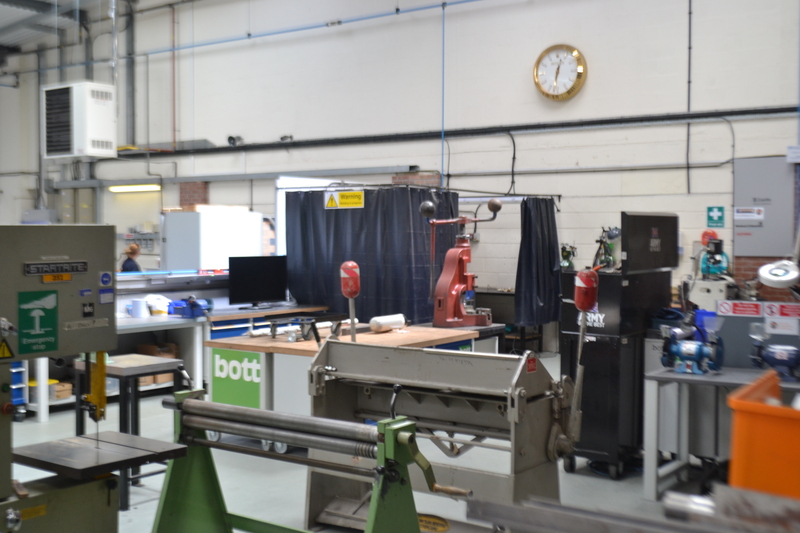 We then spoke to design engineer, Mark Elvin. He was really insightful and answered any questions we had. His background was, in my opinion, very interesting. Mark only completed one year of Sixth Form but opted to do a 4 year apprenticeship that then led him to work for Williams F1. 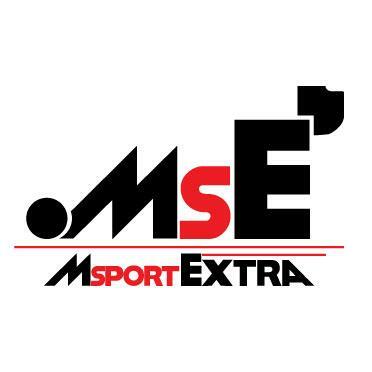 We discussed about A-Levels and university and that, in Mark’s opinion, getting to such a high level of education doesn’t prove much in terms of practical ability. We also found it odd that despite the demand for engineers increasing, the grades required to do engineering at university have also shot up. Listening about his experience in the industry and how he got there gave me a new view upon education as a whole. Should my exam results not be as good as I want them to be, there are still other options out there. So if you are reading this, Mark, thank you! 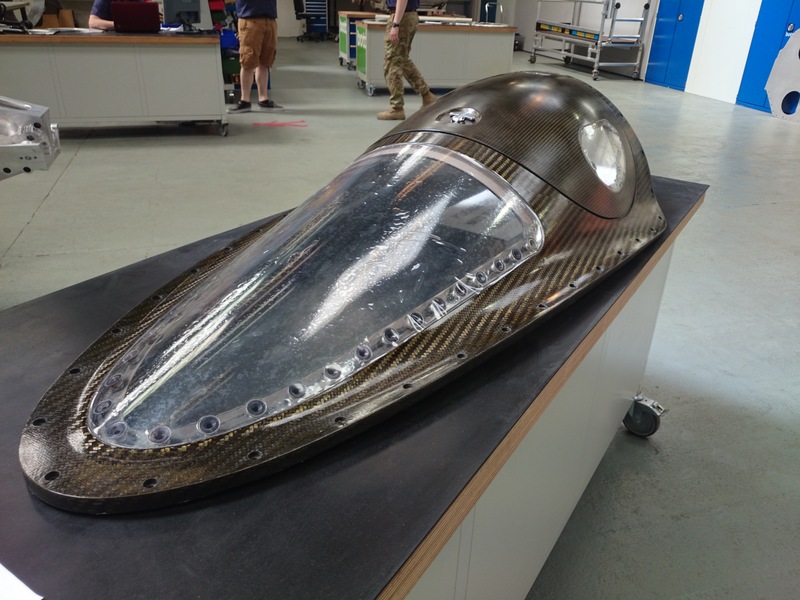 I hope you enjoyed this post and please leave a comment if you have any questions about Bloodhound SSC. I’d like to thank those who organised the event and I feel very lucky to have gone. I hope this post gives you a greater insight into the fastest car and, more impressively, fastest vehicle ever built in the world.